Miss Ann Shelley-Lloyd F.S.B.A., H.S., S.I.M. 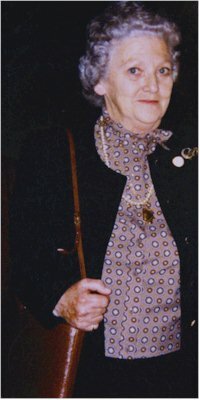 Sadly, since writing this article, Ann Shelley-Lloyd passed away on January 25th 2011. She will be remembered as an exceptional botanical and miniature artist who was a founder member of the Society of Botanical Art, and as a winner of many RHS gold medals for the excellence of her work. Ann Shelley-Lloyd was born in Surrey on October 21st, 1920. From an early age, she showed exceptional artistic talent and, at school, studied art, technical drawing and embroidery, whilst attending a course in portrait painting in oils during her spare time. On leaving school, she continued with portraiture and later studied haute couture and fashion design, before taking up various secretarial posts. The latter would soon prove to be good experience for the classified work that would follow during the Second World War, when she was employed as a machine tool inspector for aircraft and radio parts, working mainly in underground tunnels. During her spare time, she continued to paint flowers, horses and portraits. With the cessation of hostilities, Ann travelled widely both in the United Kingdom and Europe, whilst still employed in secretarial work. She eventually became a medical secretary for a pharmaceutical company and, during her spare time, produced detailed and accurate drawings of fungi for its chief biologist. This prompted her to extend her subject matter to orchids and, in 1982, she first exhibited work at the Royal Horticultural Society and won her first Gold Medal for her portrayal of orchid species and hybrids. Her delicate touch and her application of thin veneers of oil paint, much like the technique used by the Dutch School, enabled her to achieve detail and textures that are more characteristic of watercolour studies. This was to be the first of many such successes and further R.H.S. Gold Medals were awarded to her in 1983 and 1984. Unfortunately, for a time, a serious and prolonged illness in the family meant that Ann was not able to concentrate as much as she would have liked on her painting. Nevertheless, in 1988, she was awarded a fourth R.H.S. Gold Medal for her work. She became a founder member of The Society of Botanical Art and her painting soon came to the attention of art collectors and galleries worldwide. 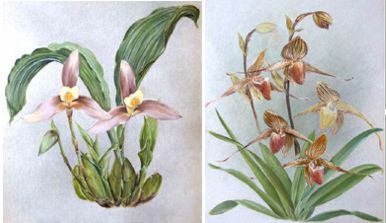 She was commissioned by His Grace, The Duke of Devonshire, to paint orchids at Chatsworth House and also by The Orchid Society of Great Britain. Much of her work now hangs in galleries and private collections in the U.K., Germany, U.S.A., Australia, Japan etc. Indeed, in 1997, Dr. Kevin L. Davies, current Chairman of the Orchid Study Group at the National Botanic Garden of Wales and friend of the artist, on seeing the quality of her work, set about ensuring that examples were placed at major institutions here in the Principality of Wales, including the National Botanic Garden and The National Museum of Wales, Cardiff. Similarly, another friend, Mr. Alan Gregg, arranged that work be deposited at The Glynn Vivian Art Gallery, Swansea and currently (2009), her very good friend Mr. Leon Habgood and Dr. Kevin L. Davies are corresponding with Ann about securing more of her work for the nation. Ann has many interests, including orchid growing, wild life, antiques and historical miniatures, ancient Egypt, classical music, classical art and travel. For many years, Ann was a member of The Orchid Society of Great Britain, The Cheltenham Orchid Society and The East Midlands Orchid Society. When staying at Cheltenham, where she was exhibiting work at an orchid congress, Ann was introduced to miniature painting by a friend during a visit to Sudeley Castle. Such was the effect on her that later, Ann was to say “I became so fascinated with this painting in ‘little’ in water colour, especially historical portraits….that it eventually took over (from) my life-size orchid painting in oil.” Consequently, she soon became a member of The Hilliard Society and The Society of Limners and continued to paint and exhibit her miniatures annually at prestigious galleries such as the Alexander Llewellyn Gallery (London) and Lannards Gallery (Billingshurst, West Sussex) until relatively recently. One of the greatest honours bestowed upon Ann was her acceptance as a member of The Royal Miniature Society, a privilege reserved for the few whose work is of an exceptionally high standard. From the very start, she was influenced by miniatures dating from the time of Henry VIII, as well as those of the French royal court, and was soon producing work of her own in this style in watercolour on ivorine and velum. However, before long, she had developed her own style and was embracing more contemporary subjects such as portraits of Jeffrey Archer and John Blowers, a former editor of The Orchid Review. Such was her dedication to her art and attention to detail, that once, having completed a miniature in the oriental style of a pair of cranes performing a courtship dance, of which she was justly proud, she approached the Japanese Embassy and asked the staff there to provide her with the title of the piece in Japanese characters! Over the years, Ann has exhibited work at the Royal Horticultural Society, The British Orchid Growers’ Association, The 14th World Orchid Congress in Glasgow, various other orchid shows and congresses, The Royal Miniature Society, The 1st World Miniature Exhibition, The Hilliard Society, The Society of Limners and the Mall Gallery. Sadly, owing to arthritis and advancing years, Ann is now no longer able to paint. Nevertheless, her beautiful paintings, hanging in galleries and private collections worldwide, are testimony to her extraordinary and prolific artistic talent.